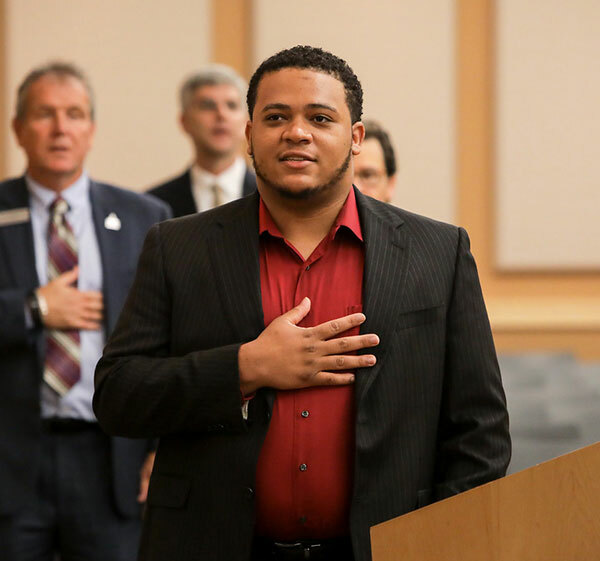 Jason Vadell leads the Pledge of Allegiance at the Board of Regents meeting held at Middle Georgia State in October 2017. Photo by Maryann Bates. High School: Sterling High School in Somerdale, N.J., where he played football and basketball and threw javelin for the track and field team. Family: Father, Jenaro Vadell Sr.; mother, Janet Medina; brothers and sisters. Degree Objective: Bachelor of Business Administration with a concentration in Accounting. Class Rank: Sophomore. Primary Campus: Macon. Activities: Vice president of the Brothers of Leadership and Distinction and Student Government Association senator. Career Goals: "I want to be an accountant, specifically working in internal business controls." He chose Middle Georgia State University because … "The price. At first I did not believe college was my calling. When I actually decided it was I was concerned about potential student loan debt. I decided on Middle Georgia State University because of the quality education at an affordable price. It was the best decision I have ever made." The greatest thing he discovered about Middle Georgia State was … "The opportunity to realize how little I truly knew about myself and the world around me. The University has taught me how to carry myself as a businessman, how to speak in front of people, how to communicate, how to lead, and how to gain many more essential attributes to be successful. B.O.L.D., Career Services, and Student Life are responsible for most of the growth I have seen in myself." His greatest academic experience at Middle Georgia State has been … "As a representative of B.O.L.D., I went to Westside High School to help kids build their soap box derby car - a STEM activity. That was my most inspirational moment. And while not an academic experience per se, I was honored to lead the opening invocation at the Board of Regents meeting held at Middle Georgia State." To him, “greatness” means … "Being the best you that you can be. It is about hard work and dedication to get to where you want to be in life. Once you accomplish all your goals and are happy, no one can tell you that you are not great." In five years … "I see myself taking my CPA exam and becoming a successful accountant for one of the big name accounting firms in Atlanta. I plan on working my way up to the top, getting an MBA, seek more opportunities and do more traveling."